Carol’s work with us was always top notch. I always felt comfortable allowing her to speak to senior management. Her ideas were always exactly what we needed, even when we didn’t know at first what we needed. I would work with Carol again in a heartbeat. Carol is a true incentive professional, we have collaborated on global project proposals and are both members of the IMA and SITE two professional associations in the incentive field. Carol is a forward thinker and has developed cutting edge technology that adds value to her clients. Keep Winning Carol. Thanks!! There is an internal memo regarding the service of your business and how great you have treated us. I was happy to reinforce the memo to fellow colleagues. Thanks for your assistance, Richard. …I wanted to thank you for your patience, time and of course, Tim Horton’s coupons at Christmas. I enjoyed working with you and your wonderful staff. …I was worried when Lynn left on mat leave. I couldn’t picture you finding a replacement that was as capable, as outgoing and as dedicated as her. But, you found Arlene, who is a real treasure. She has just been so wonderful, fun and just a delight to work with. Beverley. Carol Wain is a very organized, detail oriented executive with a keen sense of customer service for her clients. She is very knowledgeable about the many facets of the incentive marketplace. Carol is also a great humanitarian. Norma Jean Knollenberg. We believe that incentives, recognition and loyalty programs work but only when they are created with a holistic view of the organization contemplating core values, purpose, positioning, culture, external influences, challenges, opportunities, strategic objectives and goals. Easy – We work with you to get to the root of the problem then we’ll come up with the solution and create a plan to address the challenges. We engage the specialists you need, we source the best software and we select the best rewards for your audience. Effective – As your one stop source to business transformation using a variety of techniques and strategies from our specialists, you have one contract and one contact while you have a customized and personalized experience. Convenient – As your one stop source for growing your business while leveraging relationships, we do the heavy lifting and present you with a unified, yet personalized plan. Consistent – Our specialists in culture, sales, marketing, customer experience, employee experience, communication and training use the same process for uncovering challenges and opportunities and delivering solutions. You have one person who orchestrates their efforts and is your advocate to delivering exceptional experiences. Did you know 70% of employees are disengaged and 20 – 30% are looking for a new job? Your employees don’t give you their all and many are doing just enough to keep themselves employed. Did you know 70% of initiatives fail? Your employees are hard-wired to push back when you create a new initiative. We show you how to improve your employee experience – communicate better, hire better, train better, support better, remove barriers, seek input, recognize and reward more, give more challenges and opportunities to excel and grow and alter your decision making – so your customer experience, your profit, and your sales improve. Your customers demand more than ever before and they have the power of the internet at their fingertips which they use before making a purchase. Did you know that people are often well into the sales cycle before connecting with you? Marketing is now in the hands of customers too. Customers share experiences, opinions, photos, videos, deals, and promotions. Did you know customers often prefer the advice and reviews shared by strangers to your marketing messages? Customer loyalty is dead – or is it? We show you how to improve your customer experience to differentiate your business and profit. Did you know that 73% of consumers would switch to a different brand of similar quality if it supported a good cause? Customer loyalty is dead – or is it? We show you how to improve your customer experience to differentiate your business and profit. One of the best ways to grow your business is through strategic alliances or joint ventures (JV) – provided the partnership is well-aligned with your standards, your purpose, and your vision. Did you know 70% of initiatives fail though, including JVs? A JV can take many forms – from the creation of a company to create and promote a new product, to a marketing arrangement or a reseller agreement. It seems like every growth business is looking for strategic partners and herein lies the problem — too many people selling too many products. Effort, training, and mind-share are diluted and results fail to live up to expectations. We show you how to find, train, retain, inspire and appreciate the right partners to grow your business and your profit. You are in growth mode. Your goal is to grow your business by 10x or more. You know how tricky it is to add exponentially to your business – leadership, employees, customers, resources, infrastructure, finances, policies, processes all need to be in alignment so the growth is as painless as possible. You are experiencing a bit of a blip – sales are down, profit is being eroded, employees are unhappy, customers are leaving, competition has come on strong or there is a disruption in your industry. You need to do something quickly to get back on track. Your business has taken quite a hit. The little blip turned into a big problem because the decisions you made and actions you took weren’t enough to turn things around. Your business may not be around in a year or so without drastic and decisive action. You’re not yet at the stage where your lenders put you in workout but you are heading there and you are determined to turn things around now. We check you out as if we were a customer. We test your employees in person, on the phone, by email and on social media. We navigate your website. We look for roadblocks to an easy, effective, convenient and consistent customer experience which produces positive emotions. We check out your competition. We look for red flags why we shouldn’t do business with you and reasons why we should. After doing a customer experience analysis to understand where you are now – your “here” and where you want to be – your “there” – we work with you to improve your customer experience. We look at how you can improve the critical moments of truth throughout the customer journey. We help you find ways to add more value and reduce friction. Depending on your need, we can create and implement a voice of customer program, a customer loyalty program, customer appreciation events and we can train your team. We establish Key Performance Indicators (KPIs) and we monitor them, readjusting along the way. We find out what it’s like to be your employee – from casual discussions with front-line workers while posing as a customer to using a proprietary culture analysis, you will know what your employees really think about their role in your business, their supervisor’s skills and what they need to do a better job. After doing an Employee Experience Analysis to understand where you are now – your “here” and where you want to be – your “there” – we work with you to improve your employee experience. We help you to identify policies, procedures, systems and people which hinder the ability to do great work. We help you to find areas of change to inspire your employees to give you more discretionary effort more often. Depending on your need, we can create an employee recognition and rewards program, safety recognition and reward program, innovation and efficiency recognition and reward program, and/or attendance recognition and reward program. We can also provide leadership training, employee appreciation events and incentive programs. We check you out as if we are interested in become a strategic partner. What is your reputation? What value do you provide? Where are you positioned? Who do you align yourself with? How attractive are you? Then we look at who you are already aligned with. Who are your A-list, B-list and F-list partners (your profitable and valuable partners, your less profitable or less valuable partners and your unprofitable, difficult or underperforming partners.) We help you identify strategic partners who could become A-list partners. After doing a Strategic Partner Analysis to understand where you are now – your “here” and where you want to be – your “there” – we work with you to create more valuable and profitable strategic partnerships. We look for ways to better the relationship you have with your partners, add more value to them and to show you how to become an invaluable partner by helping your partners achieve success. Depending on your need, we can broker joint venture deals for you to add strategic partners, create and administer sales incentive programs, create strategic partner appreciation events and/or work with you to gain more mind-share and heart-share (engagement) with all your strategic partners. Two statements that help you understand how people impact your profit are: “Customer Experience is in every business decision” and “Every touch point a customer has with your business – indirectly and directly – is marketing.” Your employees are delivering a customer experience with each decision they make and so are you. When your brand promise and marketing messages are not in alignment with your customer experience, customers complain and they leave you. Our sister, Marquee Marketing helps travel, tourism and hospitality businesses to align their marketing with their customer experience and to use effective marketing tools to share their story. If your marketing needs a tweak or an overhaul – even if you are not in travel, tourism or hospitality – we can arrange to have our marketing specialists help you. Incentive programs, loyalty programs and recognition programs can be excellent tools to help you take your business to the next level. They can provide an extra boost to “Add a Zero”, “Stop the Bleed”, or “Find a Way” by tapping into the potential of people and their discretionary effort. They work because they give the audience a reason to do what you’d like them to do – there is recognition for effort and a reward for doing what you ask. 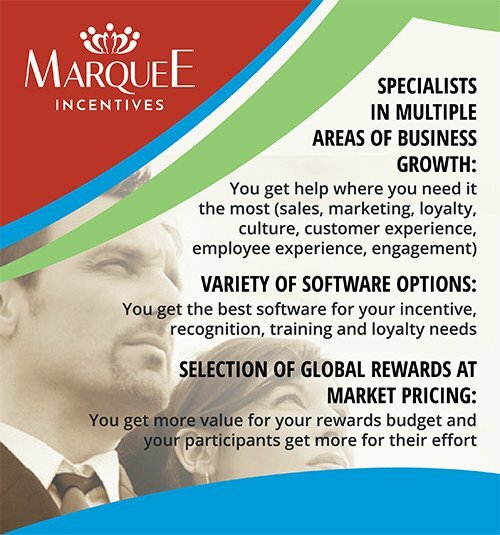 At Marquee Incentives we want your vision and purpose to come to life. We want you to achieve your goals and make a difference in the lives of those who support you. We want you to be profitable. We want you to be around in 5, 10 or 50 years from now. We want your customers to love you. We want your employees to come to work excited about their role and how they can achieve their own success. We want your strategic partners to be highly profitable because of their alliance with you. To do all of this, we help you to understand where you are, where you want to be and how incentive, recognition and loyalty programs can help. Rewards are an important part of those programs – everyone wants to know “What can I get if I do that?” We make sure the rewards they can get are desirable. 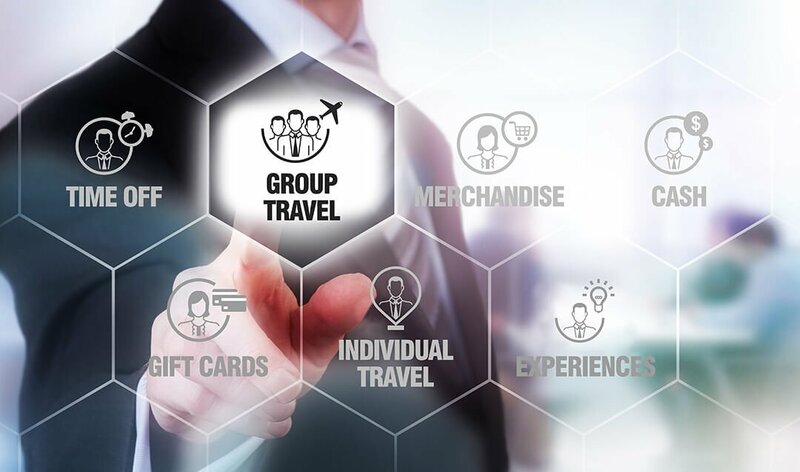 Our market value global rewards include group travel rewards, appreciation events, individual travel rewards, brand name merchandise, experiential rewards, digital rewards, gift cards and concierge rewards. Why pay 30 – 40% more for rewards? With our rewards, we have removed the hidden overhead so your reward budget goes farther and your participants are taxed (if applicable) on the market value of the reward rather than the inflated cost. Instead of burying the administration and overhead into the reward prices, we practice what we preach – transparency to help earn trust. Your administration and consulting fees will be billed as separate line items instead. Not only does this give you a more accurate picture of your investment but it also ensures we recommend rewards based on your audience rather than our margin. The post Leadership Reinvention appeared first on The Reinvention Show. Specialists in people performance, customer experience, employee experience, strategic partners, incentives, recognition and loyalty.